It can seem a daunting task trying to choose the best water filter for your home when you are presented with a wide choice of differing system types and models. We explore here some of the issues involved which may help you clarify your potential options. Ideally, the starting point should be getting a sample of your water analysed, unless you know what’s in it it’s difficult to know what needs removing. However most people will be on municipal mains supply so we will proceed on this assumption and consider this first. If you have your own supply from a well or open reservoir supplying your water then your major concerns will be slightly different. Available budget will also impact your choice, however, even if this is constrained , there is a good selection of lower priced but effective filters available on our site which will greatly improve your water. If you are in a settled situation then a more permanent filter installation would be of greater benefit. 4/ Specialist filtration such as fridge filter, boat or caravan. 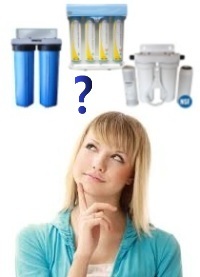 Practically all our drinking water filters are highly effective at removing chlorine. These include reverse osmosis, active ceramic, under counter & countertop. KDF, GAC and carbon block media are all effective and often used in combination. Depending upon the combination of cartridge media employed these filters may also remove PCB’s, heavy metals, pesticides, hormones, parasites, cysts & bacteria. Another major concern is fluoride, which is not added as sodium fluoride but as hydrofluorosilicic acid. For further information on the serious health implications of this practice please visit our new Blog article here. This can change, so it would be as well to check with your water supplier before proceeding with a purchase. If you require fluoride removal please visit our Fluoride Filters category which includes both drinking filters, (static & portable), and whole house systems. Your options with Reverse Osmosis systems are to have an indirect flow where the purified water is held in a small tank under the sink and is standard with most RO systems or to choose a direct flow model which feeds directly to your filter tap such as the high specification BMB NOVA -Pro or the 60lt/hr Ecosoft RObust. A further consideration with reverse osmosis systems is your water pressure. If you have low pressure, (generally below 3 bar-models differ slightly) you will require a model with an integral pump. If you have a decent water pressure then purchasing a pumped model would be an unecessary extra cost. However if you are unsure then go for the pumped version. If you have an under-performing RO unit due to pressure issues it is usually possible to retro-fit an external pump such as the easily fitted Pure-Pro SuperPump . You will also want to consider whether you prefer a single dispenser tap as supplied with most systems or a triflow tap which are normally purchased as additions to the filter package and replace your existing kitchen tap with one that also dispenses the filtered water. If you wish to use your existing cold tap, you will need to consider fitting a direct flow undersink filter which have higher flow rates. Certain under-counter filters provide this option including the Osmio EZFIT100, EZFIT200 & EZFIT300 (inc.fluoride) models which have 15mm push fit connections for easy installation onto the exisiting pipework. We have a good selection of under-counter single and multiple cartridge water purifiers from the simple but effective entry level Osmio Standard 3 Way Tap filter Kit at only £29.95, through twin cartridge systems such as the Doulton Duo with fluoride removal, at £109.95, to the Pure-Pro range- RS 2000, RS3000, & RS4000 (with alkaline filter). There are many advantages to filtering your shower water, not least the prevention of chlorine gases; a shower filter is easy to fit & remove (they can even be taken with you when on holiday) and very affordable. These filters will remove chlorine together with sediment and a good number of other contaminants. We also have shower filters which will remove bacteria to clinical standards. A Whole House water filter will provide you with pure water throughout the entire home, for drinking, cooking, showering, bathing; no need for a series of separate filters. The points for consideration are again, are you fluoridated? If so we recommend the Osmio EZFIT400 and the Osmio Active Ceramics Small Whole House Filter for the smaller household and the PRO11 XL Advanced or PRO111 XL Ultimate for the larger home, depending on flow rate requirements. If you are only concerned with chlorine and other common contaminants then your choice of filter will revolve around flow rate requirements and any sediment issues that may exist. Another consideration is turbidity. If your incoming water is high in sediment you will require a pre-filter. The specification needed will depend on the amount of sediment. In many cases a 5 micron cartridge will suffice , in cases of heavier contamination this may need to be preceded by a further cartridge of 20 microns. We have a range of Pre-Filters. A final consideration with regard to the above filtration systems is the issue of limescale removal. Some filter types such as those ultilising the Active Ceramic cartridges offer the additional benefit of scale prevention, this will be stated under individual product description. If limescale is a major consideration for you however you may want to consider additional specific scale reduction measures. We supply a number of Scale Treatment Systems at very competitive prices, which work in various different ways. It is perfectly possible and sometimes very advantageous to design your own combination of water filters to meet your requirements (we can help with this) through the use of filter housings which can then be occupied by specialist filters of your choosing. If you have a well or other private water source your concerns are likely to revolve more around the issues of sediment and biological hazards, however, chemical contaminants such as pesticides & herbicide run-off may also be of concern. We would suggest the use of one or more Pre-Filters followed by a UV Sterilisation system. Where there are possible chemical concerns or as general good practice we would suggest adding a carbon block filter between the two. See our Whole House Filters. If you are still unsure of the most suitable system for your needs please Contact us using the Chat/Message box below, the Contact form, or just phone us on 0203-507-1879 and we'll do our best to help find your ideal water filter.